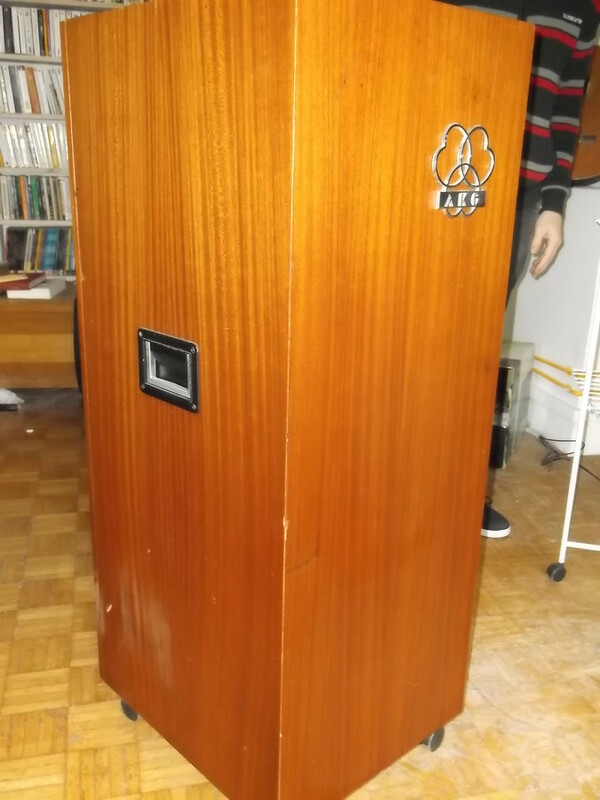 The plug-in version is based on the AKG BX20E1, a tall, wood encased outboard spring reverb unit from the analog era with a reputation for warm and dark sounds. 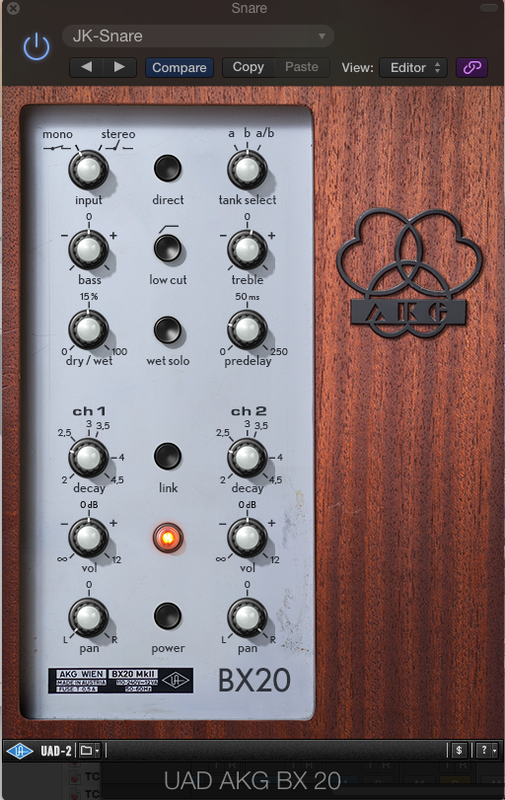 According to Universal Audio, the AKG BX 20 plug-in is not strictly a convolution or algorithmic reverb, but instead a hybrid, which also employs an “advanced delay network” that models the original unit’s two-stage delay. The BX 20 plug-in can be opened in mono, mono-to-stereo, and stereo instances. The mono version looks the same as the other two, but the Input select switch at the upper left is locked in the Mono position. 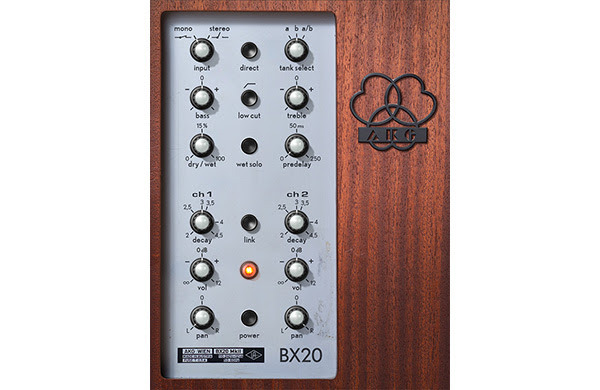 The UAD AKG BX 20, an excellent sounding spring reverb emulation. The plug-in, like the hardware unit it emulates has two “tanks”: A and B, which each sound somewhat different. When you switch between them, you can hear that Tank B is brighter than Tank A. Under stereo use, these are stereoized versions of the mono tanks. You can select A exclusively, B exclusively, or use the two together, by turning the Tank Select knob on the upper right to A/B. It's possible to get stereo reverb sounds that feature Tank A on one side and Tank B on the other. In a mono instance, you could have a mono reverb with sounds coming from both tanks A and B. In addition to the aforementioned Mono/Stereo and Tank Select knobs, the upper section of the GUI is also home to Bass and Treble, Dry/Wet and Predelay (0-250 ms) knobs, which are global, affecting both channels. "When Direct is engaged (when switch is depressed), the direct signal component within the reverberated signal is audible. When disengaged, the direct signal component is removed from the reverberated signal." According to UAD, sources with strong transients like drums can sometimes overwhelm the sound of a spring reverb, and turning Direct off helps keep this from happening. I didn't notice any problems such sources in my testing, however, and when I did try turning Direct off, I didn't hear much of a difference. That's not to say that it wouldn't come in handy at some point, I just never had need for it. In case you're wondering, the Direct button was not on the original hardware, and is only possible in the world of plug-ins . Rounding out the controls in the top section are the Low Cut switch, a filter that reduces processing below 80 Hz, and is useful when there’s too much low-end clutter, and the Wet/Solo button, which, when enabled, sets the plug-in to 100% wet, for use on auxiliary channels. The lower part of the GUI features the individual controls for Channels 1 and 2. Each channel has Decay, Volume, and Pan knobs. The Decay ranges from 2 to 4.5 seconds. In the middle is a Link button, which links Channels 1 and 2 when activated. Otherwise, they can be adjusted independently. By setting the Channel 1 and 2 Volume controls to different levels, you can accentuate the stereo effect by making one side of the reverb signal a little louder than the other. Rounding out the control set is the Power button, which turns on or bypasses the effect and the indicator light. The latter does more than just show that the Power switch is on. If you change Decay or Tank settings, it flashes while the impulse responses for the new setting load (it takes about a second). Similar loading also occurs when switching between presets. Therefore, UAD recommends against using standard (continuous) automation for the Decay parameter or for the switching of presets, because sonic artifacts could be produced during the loading process. It recommends using snapshot automation and only having the snapshots change when no audio is present. 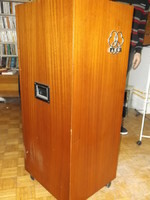 An original hardware BX20E reverb unit. 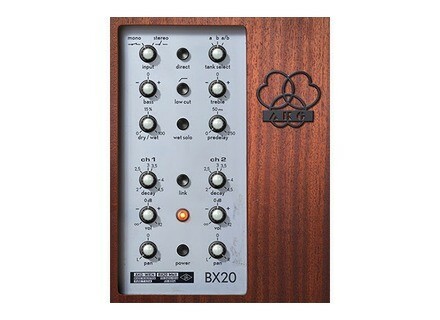 I tried the BX 20 out on many different sources, and considering it’s a spring reverb emulation, I was surprised by how much I liked it on virtually everything I tried it on. It definitely has sonic similarities to a plate reverb. Here are some examples of it in action. I'll start with an arpeggiated electric guitar. The first two measures of this example are dry and then the reverb kicks in. Both channels of the reverb are set to Tank A, but the volume of the reverb on Channel 2 (the right side) is higher, which accentuates the stereo effect. I really liked how the BX 20 sounded on drums. Here, I applied it on a stereo drum loop, and this time used tanks A and B (left and right) in the setting. Here’s another stereo patch, this one on an electric piano part. The reverb gave a nice warm sheen to the Rhodes-type piano sound. This one uses Tank B exclusively. I normally wouldn’t think of using a spring reverb on a vocal, but the BX 20 changed my mind. Here it is on a track featuring soloed lead and background vocals, with Tanks A and B being in the setting. Finally, here it is on a snare track in a multitrack drum mix. Again, not a place I’d normally think of using a spring reverb. Thirty presets are included with the BX 20, many of which are of the “celebrity” variety; that is, created by well known UAD users. Patches are included from Patrick Carney, Vance Powell, John Paterno, Jacquire King, Dave Tozer and F. Reid Shippen. I found these patches helpful as examples or starting points, but I ended up tweaking most of the ones I dialed in, especially the Dry/Wet settings, to fit the music I was working on. For me, the AKG BX 20 ($199) was a very pleasant surprise. No, I wasn’t surprised that UAD made a great sounding reverb plug-in, they make lots of them. In fact the EMT 140 plate reverb is my favorite software reverb. What did surprise me was how smooth a spring reverb — that is, a spring reverb emulation — could sound, and how many sources I could use it on. If you’re looking for a different-sounding reverb, you're going to love the warm, dark, smooth, and surprisingly versatile BX 20. If you’re already a UAD owner, you can get a 14-day fully functional demo of BX 20 (as with any UAD plug-in) after you download the v8.3 software . If you don't own a UAD hardware unit, this plug-in might make you think about getting one.